Last night I came home from work starving and decided I wanted breakfast for dinner. 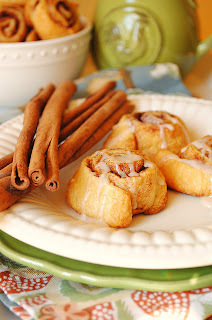 I perused Pinterest and came across this pin from How to: Simplify for crescent cinnamon rolls. They looked quick and easy so I figured, why not? The recipe begins by unrolling the crescent rolls into two rectangles and brushing melted butter and cinnamon and sugar on the top. The next step is to roll up the crescent rolls. Then cut the rolls up and place on a foiled pan. As you can see, my crescent rolls did not hold their shape when I rolled them up. They started to tear and fall apart. I think only one (in the middle) held its shape. Throw the rolls in the oven set at 375. While they were baking, I mixed up the icing. I had to add extra milk to the icing because it was way too thick and had a paste consistency. The Verdict: The jury is still out on this one. Although they didn't look that great, they tasted great. The icing itself was delicious and simple to prepare. Overall it was a quick and easy recipe- the presentation was just lacking. I will say that while I was making them, I was starving and in a rush. Maybe if I took my time I could have had a better looking end product. To be honest, I'm not sure if I'd make them again. I may just stick with the 'place and bake' Pillsbury cinnamon rolls. Things to Consider: I think the recipe called for way too much cinnamon and sugar then was needed for just one container of crescent rolls. Also, make sure to watch the baking time. I wasn't paying attention and they were close to burning after 8 minutes.